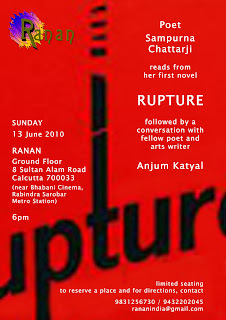 Photographs of this event at Ranan on 13 June 2010. Thank you, good people at Ranan, for opening up this beautiful space. 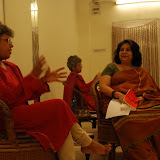 Reading from and talking about my first novel here has been an experience I shall cherish! May this be the start of many intimate interactive sessions. Ranan is delighted to present the first public programme at our own space. Poet Sampurna Chattarji will read passages from her first novel, Rupture, followed by a conversation with fellow poet and arts writer, Anjum Katyal.